MarketersMEDIA / Newsroom / What is Better Than Easter Eggs This Easter? What is Better Than Easter Eggs This Easter? 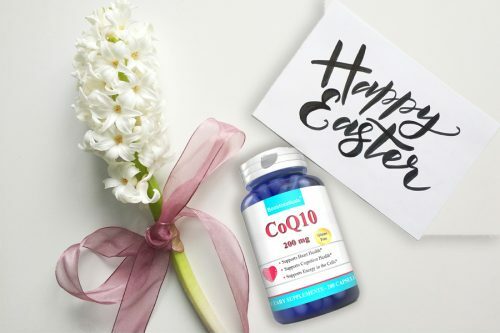 In honor of the Easter Holiday, join Boostceuticals, a rapidly growing nutritional supplement company, in heralding health and wellness in every family with their best-selling Boostceuticals Coq10. With Boostceuticals Coq10, one can enjoy their boost of energy and stamina in a natural way. New York NY, United States - March 28, 2019 /MarketersMedia/ — With Easter so close, family gatherings with fantastic meals and treats is on the way! For the health conscious the quest of a healthy Easter and year is important. It is a challenge letting go of healthy routines for a time full of indulgences! Those choices matter, but so does managing stress. Unknowingly, pleasing family members, work deadlines, and the load of work you postpone for the holiday are just few of the stressors that can make what should be a relaxing and contemplative time far less pleasant. Research connects stress as a risk factor for high blood pressure, cardiovascular disease, and cancer. Stress can also impact the immune system. One over arching study of over 300 studies spanning 30 years found that chronic, nagging stress can make one sick. However, it is possible to enjoy Easter whilst also taking care of one’s body, mind and soul. Boostceuticals Nutrition is releasing a must-not be missed deal to prepare everyone for this Easter. "We are committed to offering safe, natural, GMO-Free, Gluten-free and lactose-free supplements to our customers. Every bottle is manufactured to the highest-quality standards in the USA in an FDA certified facility adhering to all GMP requirements. Every step is taken to ensure the development of superior and best quality nutritional supplements. We believe that our best-selling Boostceuticals CoQ10 is the best ‘Egg’ we can give to everyone. “ said Leo Eliades, CEO of Boostceuticals. CoQ10 is a naturally occurring enzyme in yhe body’s cells, which is used by the cells to produce energy. Studies upon studies have shown that supplementation with Coq10 is effective and safe. Boostceuticals Coq10 can increase energy, endurance and stamina levels without relying on the rush of adrenaline those chocolates promise. Boostceuticals CoQ10 works at a cellular level to provide organs with the energy they need to perform efficiently. It also gives the immune system support and as a powerful antioxidant it helps aging and harmful oxidation. Most of all Boostceuticals CoQ10 offers the ideal potency to support heart health and blood sugar control. Boostceuticals is dedicated to supporting people on their pursuit of supreme health. With the right blend of nature and science, all Boostceuticals supplements are manufactured to the highest-quality standards in the USA in an FDA certified facility adhering to all GMP requirements. Every step is taken to ensure the development of superior and best quality nutritional supplements. With its use of natural ingredients and being GMO free and gluten free, it has become the sensible and healthier choice for every American household.